The title says it all. And for those unfamiliar with the term, sweetmeats includes mainly jams, jellies, and preserves. 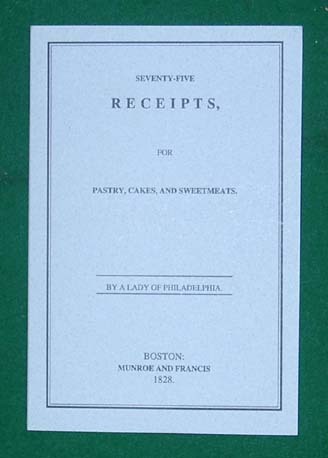 One element that makes this cookbook interesting is that, of the four that we carry, this is the only one with "modern" receipts. By that, I mean that this is the only book of the four where a recipe begins with a listing of all the ingredients followed by the instructions for preparing the item. Since it predates the other two cookbooks, one can only surmise that the method didn't find favor with other cookbook writers.